We mostly associate wreaths with certain occasions such as Christmas and funerals. 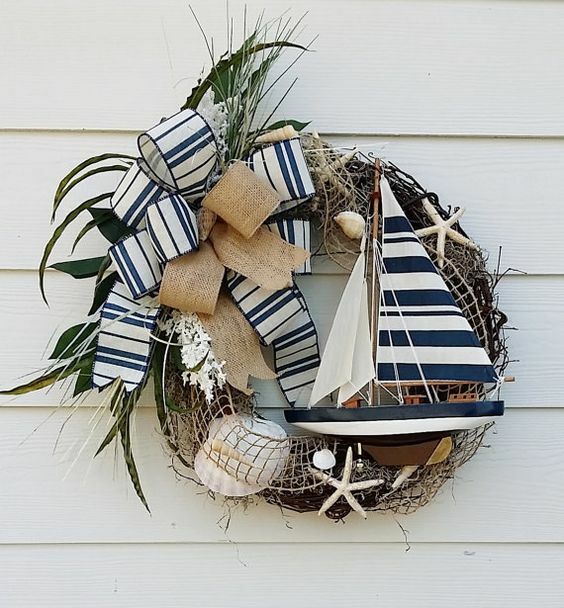 However, did you know that wreaths have a long history and are associated with harvests, memorials and even victory in athletic events? 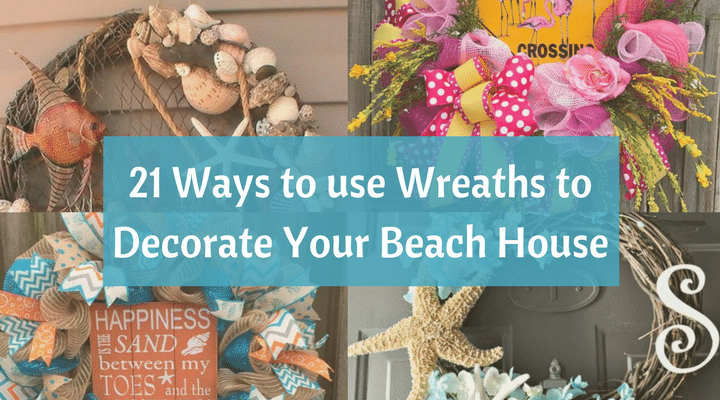 Wreaths are a colorful and economical way to add some liveliness to your home. 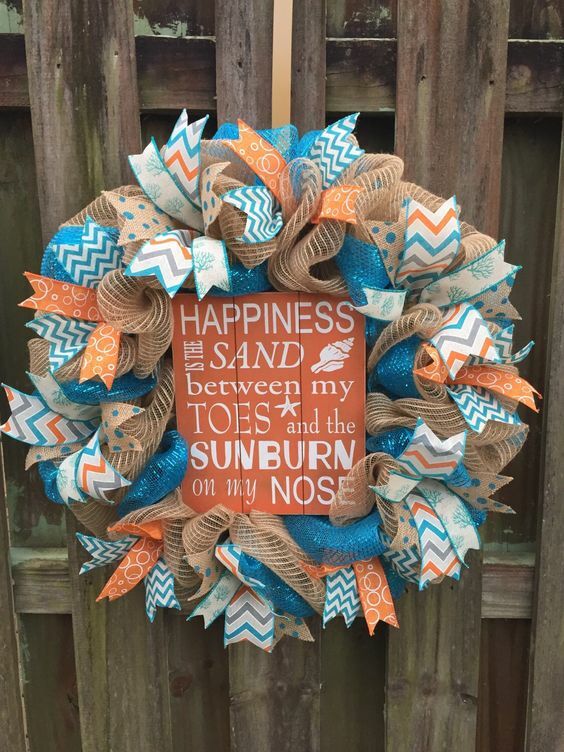 Wreaths may be made from multicolored ribbons and gauze, framing a life-affirming quote or poster. 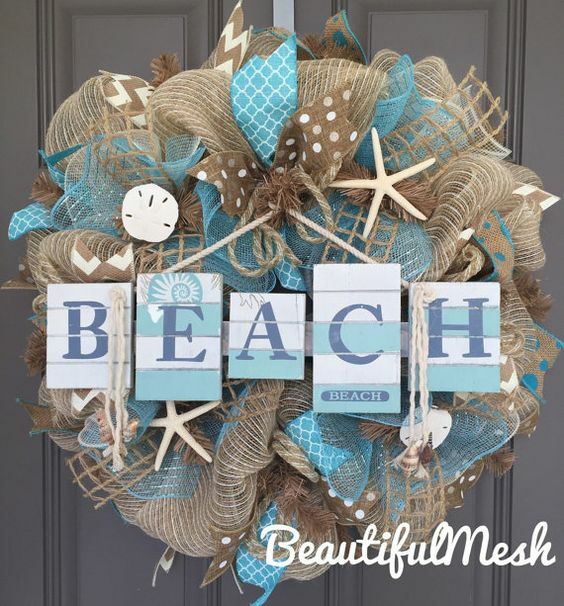 The wreath can serve as a sign to welcome your guests and friends to your home – and a reminder of what beach life is all about! 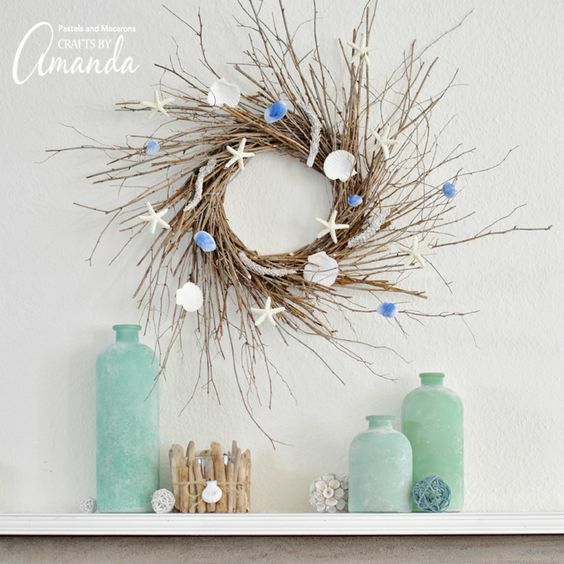 For an oceanic theme, a garland of sea shells, mollusks and dried flowers makes for a superb display. Ready to flaunt your flamingo love? 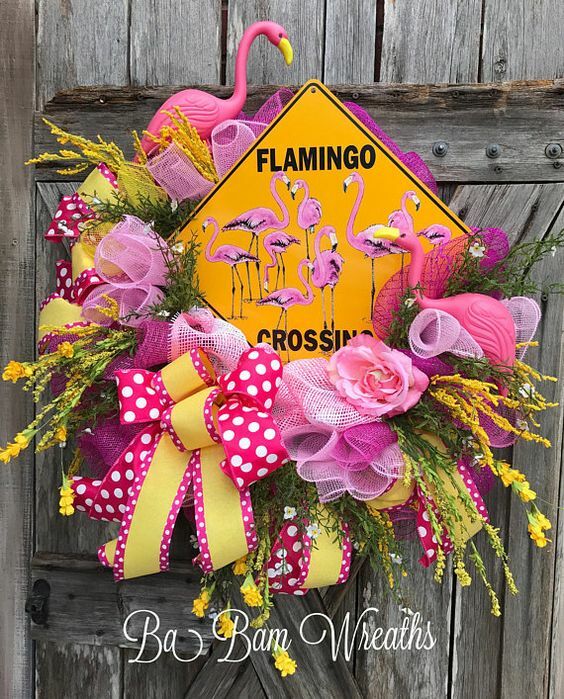 Pink ribbons, plastic flamingos and some bright flowers will certainly get the point across. Deck the halls with boughs of…. starfish? 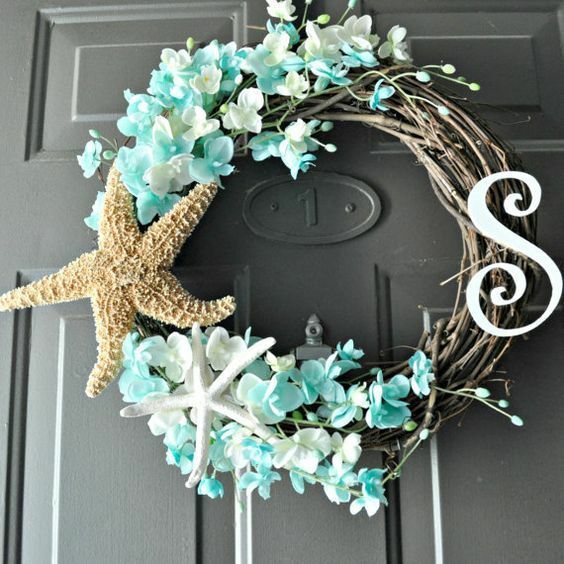 Blue flowers with starfish on a wreath reinforce the beach look. 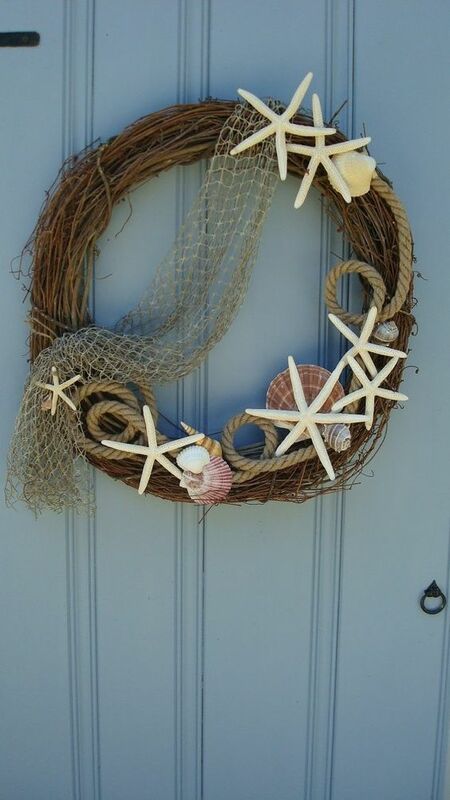 Use bits of rope, net and shells along with some starfish to make a wreath that will delight any sailors who may pass by. 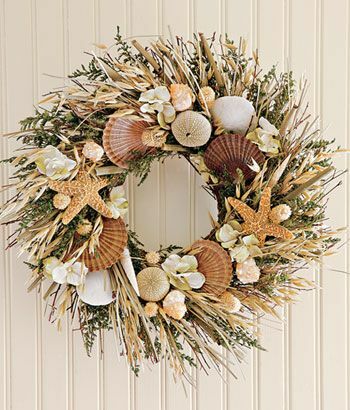 Inspired by harvest wreaths, this fancy garland uses green and gold plants as well as sea shells and starfish to evoke the bounty of the sea. A fine look for the dining room. Love boats? 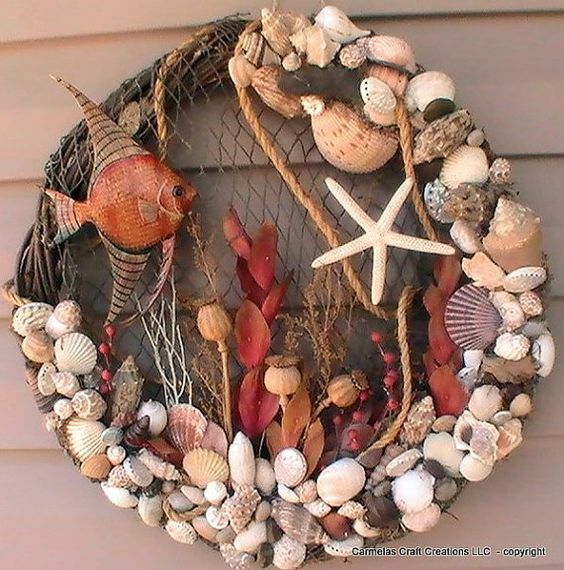 They’ll look great on a wreath, along with some shells and ribbons. Every sailor should know their knots. 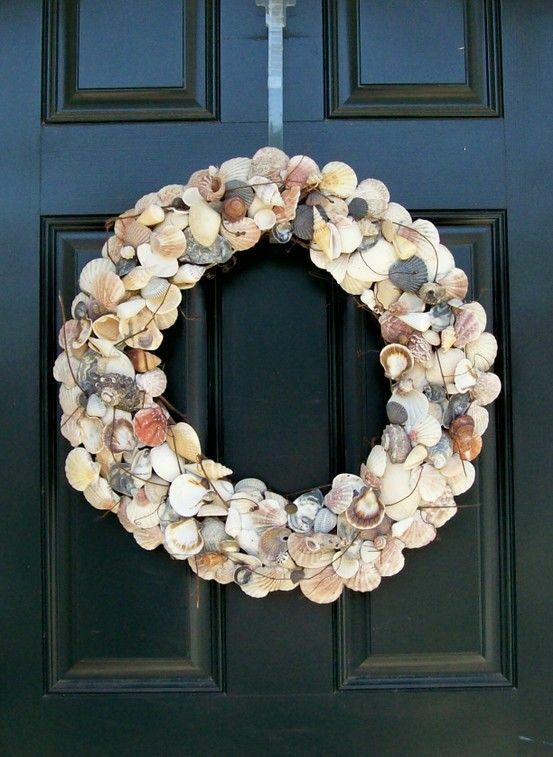 Hitch a few ropes together for an unconventional wreath with some shells for decorations. 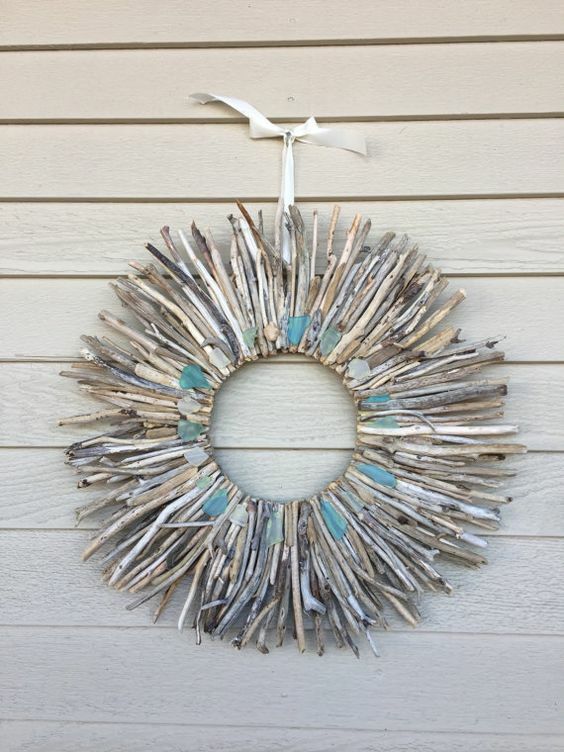 You don’t always need evergreens for wreaths. 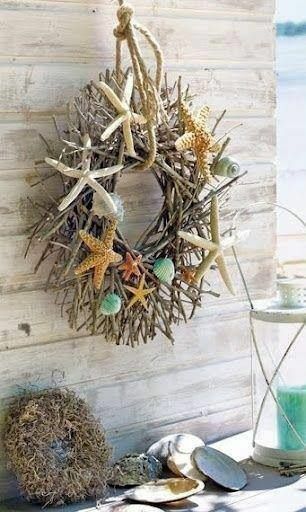 A few twigs and glue are all you need for a sea-themed garland that makes your beach house stand out. A not-so-subtle reminder that the beach is where it’s at! 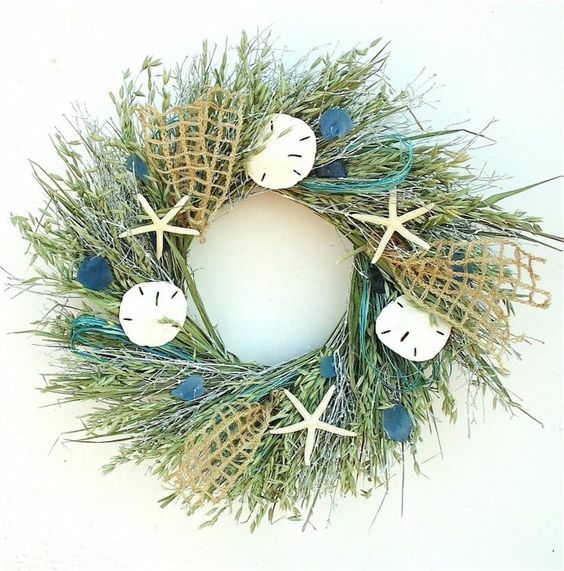 Festive and fun, this simple straw wreath would not look out of place on a Greek island. 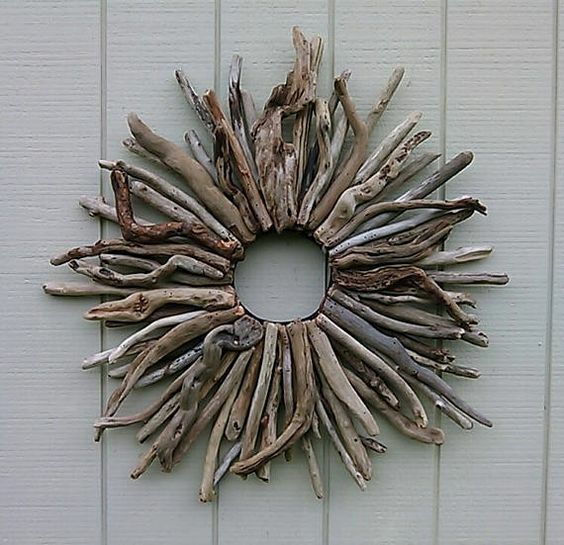 The use of driftwood branches makes this wreath stand out from other kinds. And the sun-like shape it creates definitely reminds us of one of beach’s great blessings. Sea glass and twigs from drifting branches. What’s not to like? 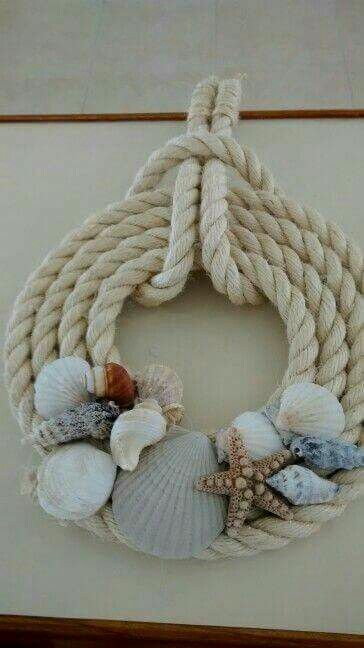 A pretty arrangement of shells in a ring. It looks like it took a lot of walks after the tide went out to gather the elements! 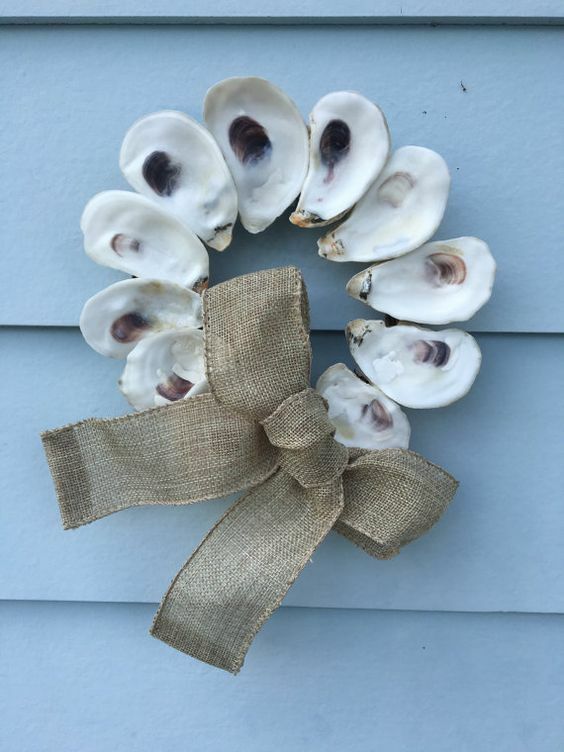 The inside of oyster shells is as suitable for wreaths as the outer side. It’s a unique look for sure. 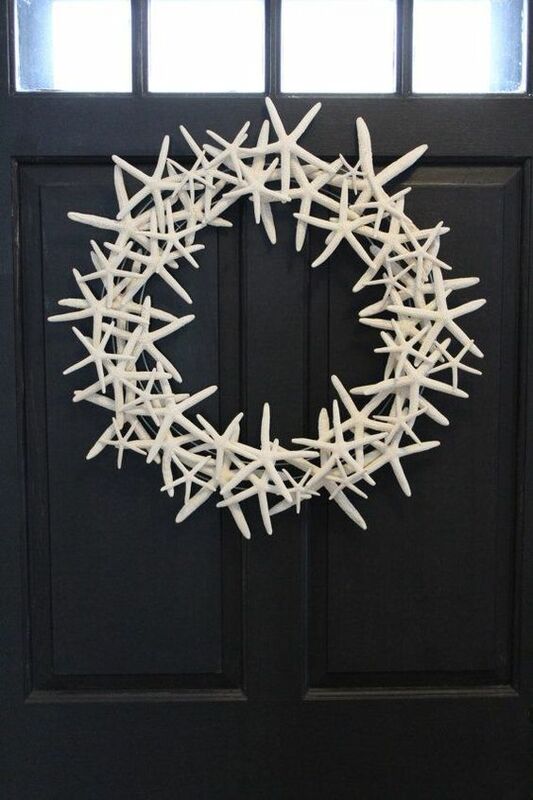 Perfect for dark backgrounds, a wreath of bleached starfish is modern and elegant. 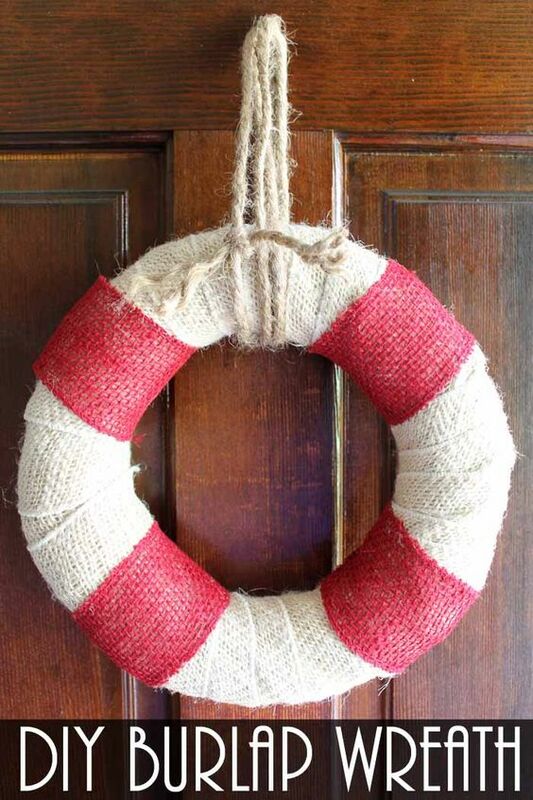 Make your own lifesaver wreath with bits of colored burlap. A reminder that your beach house is a lifesaver after the stress of life! Nets, gauze and weeds make up this wreath. Small stones and starfish add to the beach attitude. 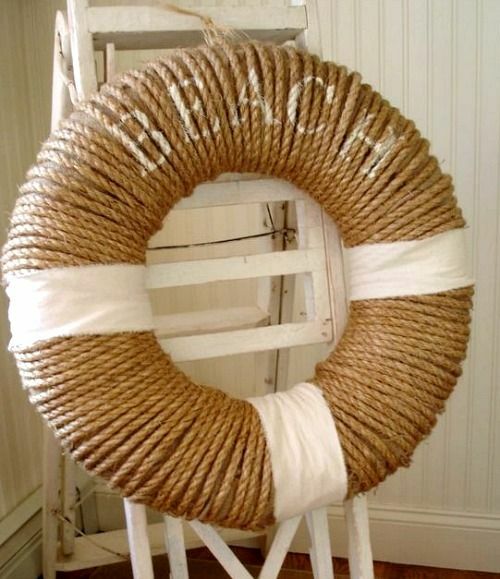 Lengths of rope twined into the shape of a lifesaver make an ideal decoration for the nautically-minded. Pine cones painted bright blues and whites make up this very special garland, suitable for both the outdoors and the indoors. 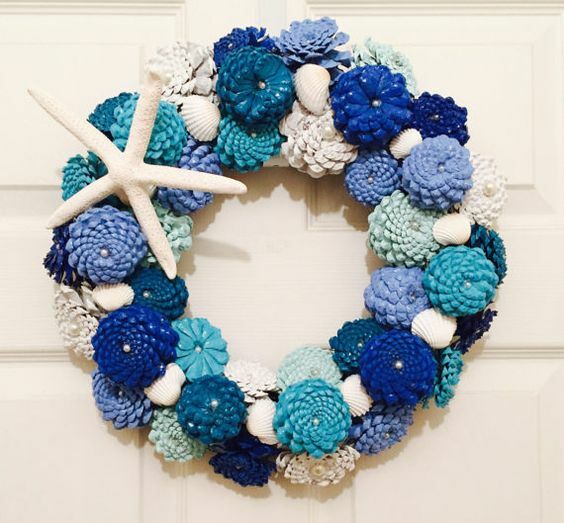 The next time you’re stumped for ideas to brighten up your beach home, try some sea-themed wreaths. 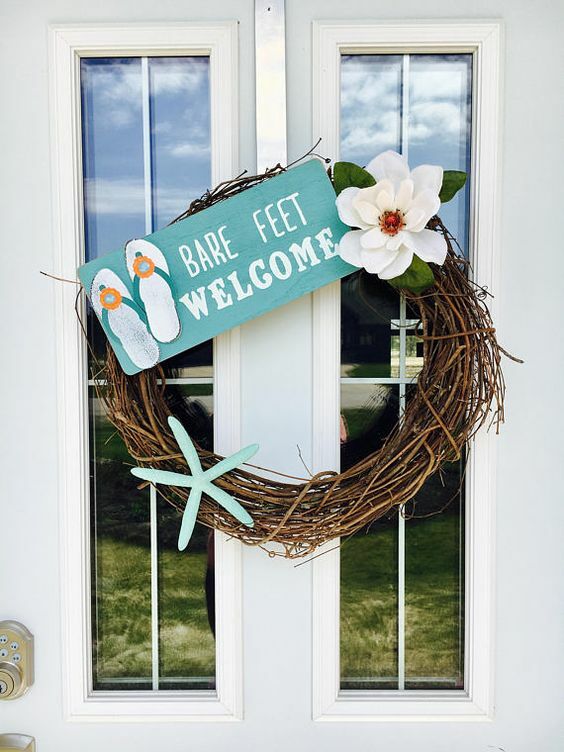 Whether it’s for the bathroom, dining room or your front door, this quaint traditional decoration can be surprisingly modern and suitable for a variety of uses.